« The UK Tea Council – Tea Lovers of the World Unite! It’s Tuesday, you seem to have used up all your motivation just for Monday & even though it’s only the second day of the working week, you’re running out of energy with a list of things that you wished you’d found a spare moment to sort over the weekend. It’s later than you’d hoped, you’ve had “one of those days” & the last thing that you feel like doing is, well, actually anything at all! But what will you choose to do on Tuesday 8th March? 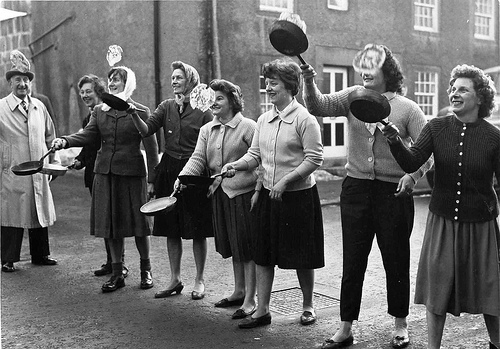 Many of you will know this is Pancake Day, or otherwise know as Shrove Tuesday. The day has its origins in religion…but that’s far from the reason I mention it here. 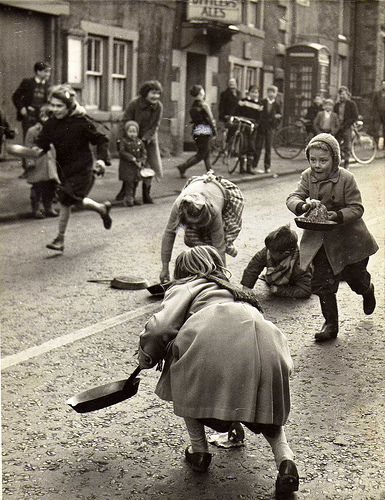 wonderful Pancake tossing 1950s pictures are by Micheal Greatorex Winster Derbyshire. As a child, I remember the whole night being devoted to making our pancake creations – no “proper” tea, it was all pancakes until you couldn’t fit anymore in! I’ve realised that our pancakes were a bit different too – they had currants included! Yes, you put them in when one side was still cooking so they ended up as part of the pancake. & you’d never volunteer for the first one out of the pan, as more than likely, the cook would not have their hand in at that stage, it would be too thick, or broken. It was such a competition to make the best, the most perfect pancake! But here’s the thing – I remember those nights from my childhood as special, & it was such a simple thing that will be part of me always. 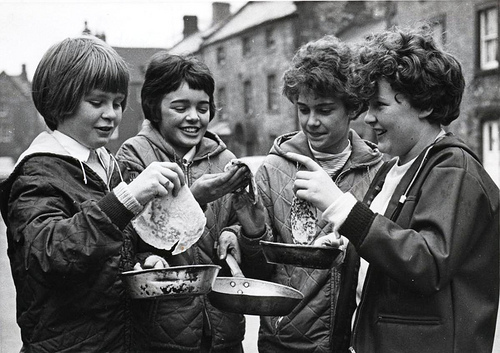 Pancake day- Wonderful 1950s pictures are by Micheal Greatorex Winster Derbyshire. Tea with Mary Kate seeks to inspire using seemingly ordinary everyday activities as the portal to connect us to those that matter & to what can give us purpose & meaning. So, if you’ve come this far & are wondering what this has this to do with a Pancake tea, then you may as well read on……instead of thinking – oh why would I do anything at all? I’d like to paint another picture, to inspire you to another vision of what joy, what fun, & how lovely & memorable that Tuesday Pancake Tea could be. Make it special, lay the table with a beautiful table cloth, use your favourite crockery – what else are you saving it for? & bring out your favourite tea cups. Ok, so I will concede, it is far from the healthiest of tea, but the feel good that it is generating will do everyone the world of good. And if you are feeling totally adventurous, have a tossing competion…or go for it, and have a race! While you are whizzing the milk, eggs & butter to make that all important batter in the mixer (or hey, cheat & buy a packet to mix), because you’ve decided that the joy is in the doing, the excitement is in creating a bit of a mess when you are tossing. You can employ the rest of the party to create a gorgeous fruit salad that you can graze on while the serious stuff of pancake mix creation is going on. But here’s the really lazy method – buy them already made – I know, it’s amazing that you can do this & they are quite nice…….. & if you are near Stoke or the Nantwich Saturday Market, you can buy some from the London Road Bakehouse, a really wholesome bakery that has brought back to life it’s coal-fired ovens. The bread is absolutely gorgeous too! And of course, hot, warming tea! With pancakes, I really recommend Lapsang Souchong, a gorgeous smokey tea, with a dash of honey, or Pembrokeshire Tea company’s Rose tea (see blog article also), as you want something that is full of flavour but without the milk, as you’ll get more than enough from the pancakes! If whizzing up some eggs, flour & milk to create your Pancake mix even at this point is seeming like a step too far, rush to inspire a friend whose more adept on the cooking skills front – & invite yourself around with your other skills in tow. Although I would say that DOING IT is half the fun, I concede that you all may not be on the page of that’s going to be a great idea, but perhaps you can be the catalyst for the opportunity to pause, as these are the times that can nurture our spirits and give space for knowing & healing. The wonderful 1950s pictures are by Micheal Greatorex Winster Derbyshire. What will you plan to do for pancake day?